Cecilia, my Argentine-American friend, had me over last month for Magic Gnocchi Night. She seemed excited about it, and I was intrigued. What would be magical about it? On the 29th of every month, Argentines eat ñoquis (gnocchis, as we would say). For the uninitiated, gnocchi is a potato-based pasta. It is pronounced nyoki, with the n and y run together. Like a lot of Argentine dishes, this flavorful dish has Italian roots. Many Italians worked on coffee plantations in Argentina during the 19th century, and they left a permanent impression on the culture’s cuisine. It was just the two of us for the celebration, and I was honored to share in this tradition from Cecilia’s childhood. She lit candles, and we spooned the savory meat sauce, Tuco (an Argentine derivative of the Italian word for juice: suco ), over our steaming bowls. Careful instructions followed: put money under your plate. Donate that money (it has to be that money, now warmed by the plate) to charity after the meal, and it will bring you good fortune. We toasted our friendship and chatted eagerly over our modest feast. Why gnocchi? Why the 29 th? 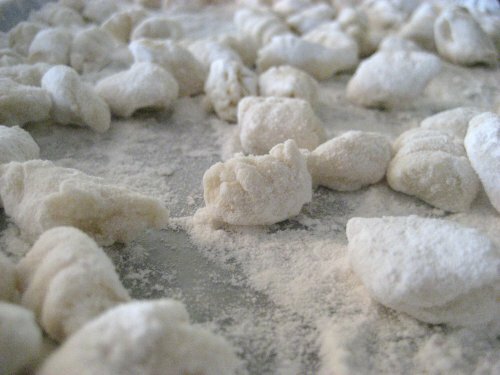 Gnocchi is cheaply made and belly filling, a combination appreciated by the working poor on the night before payday. The story goes that a poor family welcomed a hungry man into their home and shared their gnocchi supper. To reward the family’s generous spirit, the man, who was a saint in disguise, left a gold coin under his plate. Hard financial times in Argentina after World War II may have helped the tradition to grow, and now Gnocchi Night is practically sacred. My friend’s family has collected many tales of dire financial straits that reversed after the monthly ritual. What a refreshing spin, to celebrate the cheap meal, to make the best of running low on grocery money. I love the tradition of sharing what little you have and, with that sharing, nurturing hope for good fortune. Clearly the Argentine populace is infused with good spirits and good humor: government workers that are scarce except for when paychecks arrive at month’s end have been nicknamed ñoquis , too. I carried my twenty dollar bill around for more than a week after that first Gnocchi Night until, on impulse, I pulled up at the local food pantry with cash in hand. I dashed in (they were closing for the day) and was immediately impressed by the happy looking children around the place. No hint of embarrassment or hesitation here, just a wide-smiling joy at the anticipation of a filling meal. I thought back to my warm feast with a close friend and was glad to pass on my blessings. Gnocchi can be made from scratch, of course, and any decent Italian or Argentine cookbook would contain a recipe. But it can also be purchased from the supermarket pasta shelf or freezer section, a modern twist I have put on this delightful tradition. Here is the sauce recipe, also modernized (with canned tomatoes). Warm oil in large stock pot. Brown meat on medium high. Add onion and sauté on medium until soft. Add garlic and red wine. Add spices. Add diced tomatoes and tomato paste. Simmer on low from 20 to 30 minutes, adding broth as needed if mixture appears too thick. Spoon over warm gnocchi. Katherine Hauswirth has been published in many print and online venues, including The Writer, The Writer’s Handbook 2003, Byline, Pregnancy, Pilgrimage, Writers Weekly, and the book Things My Mother Told Me: Reflections on Parenthood (available at amazon.com). Her blog, Inching Toward Simplicity, and more on her work, can be accessed at http://inchingsimplicity.blogspot.com/.